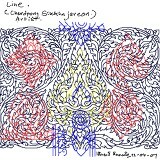 New art work in the LINEart “In Remember” series. Some Balance shape and some dynamic, line in the remember. Pigment ink on paper, Lineart.